Don’t sweat it, we are here to help you understand. A very broad definition that we’ve used before describes robotic process automation as “a useful tool for maximally efficient use of a company’s available resources” (“tool” covers both software and services). Its most important trait is functionality, operationalized in terms of capacity to facilitate an optimal resource allocation leading to best possible business results, all other things held constant. What kind of benefits can be reaped from RPA? Software robots can help reduce costs by being highly scalable, quasi-error-free and fully fatigue-free, they can improve business competitivity (which is why they are much needed also by small- and medium-sized businesses) and results accuracy (in Daniel Pullen’s words, they “ensure that end users are receiving accurate and current data”), they enable high level communication, foster human-machine collaboration, support compliance modernisation, and more. The ultimate objective of all these improvements by means of robotics is increased employee and customer satisfaction. Therefore, it is plain to see that RPA instantiates a kind of ‘best case scenario’ of cooperation between humans and robots. A look at Australians’ interest in robotic process automation (see graph above) over 2016 and 2017 according to Google Trends, might well indicate rising awareness of its positive features in the general population. And the future looks even brighter, as you can see for yourself in the graph below, showing the forecasted global trend until 2021. 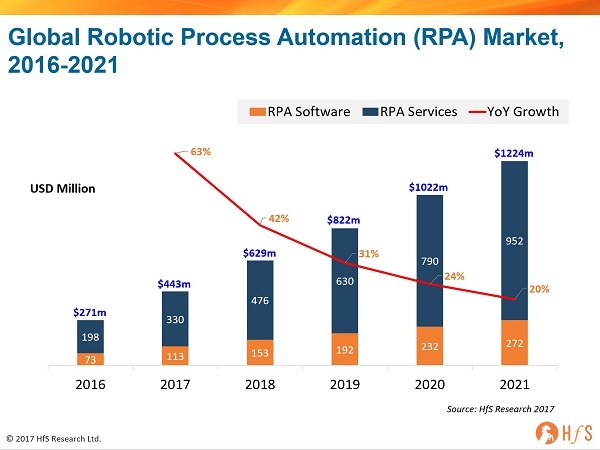 An HFS report from last year predicts a rise in the RPA market from $270 million in 2016, to $1224 million in 2021. The growth rate from 2017 to 2018 is the most prominent, close to 50% (which is larger than the 36% annual growth rate over the five years). So you need not make a leap of faith to start automating your business processes now, but rather a leap of reason. Because RPA is becoming a must for competitive businesses. Let us now go a little deeper into the nuts and bolts of RPA procedures. Robotic process automation emulates the actions of a person - this is, in fact, why it is called robotic. Software robots mirror human employees’ actions such as filling in spreadsheets, copying and pasting data in required fields, merging data, etc. They do so in an automatic way, which means fast, objectively, and undepleted by errors. A crucial gain of RPA is that implementation doesn’t require programming skills. Once a program has been set up by a technically proficient person, the robot only needs some programming instructions regarding the programs that it should use, and the precise way to use them. By means of a Graphical User Interface (GUI, which is provided by the RPA vendor), anyone should be able to program the bot in the above sense. Use of recorded actions (which could be pretty much any kind of routine employee action) is another facilitator of setting up RPA; in this sense, software robots are analogous to excel macros. All in all, like David Eddy from UiPath emphasizes, RPA is a maximally effective technology, without the burdensome technical requirements that you might expect. But only now comes the best part! The software robots can actually learn from the recorded actions so that they can then perform automatable tasks. They might require some human guidance in the learning process, in order to avoid errors. What can software robots actually do? Firstly, it’s worth mentioning that most providers offer software and services that work on Windows systems. Mac OS or Linux environments are not used by many for office work, which is why RPA is not a frequent option for these systems. Most importantly, robots can do a great job at many of the activities that are common to pretty much all kinds of businesses, those activities that no company can do without. Because software robots can easily integrate data from different systems and applications, they can replace employees from tedious tasks like data migration, keeping inventory records up to date, preparing regulatory reports (think compliance) and delivering them to the required officials, sending mass emails that incorporate data from different systems, etc. Bots’ integrative capacities also become salient when they engage in extracting invoice and payment data from multiple systems (such as banks, merchants, or logistics companies). Because of their ease to handle numerous regulation changes, they can be of great help when it comes to claims processing. There are two broad categories of automation: attended and unattended (see also our RPA Glossary). In attended automation, software robots assist human employees mostly working at the front-office. They basically augment human capacity by facilitating real multi-tasking. A rep can thereby engage in interaction with a customer, while at the same time “completing manual work”. We use quotation marks here because it is actually the robot that performs the necessary manual operations (e.g., data entering), either fired by the rep via an attended automation code, or automatically launched. In the case of unattended automation, bots operate with minimal human intervention (mostly supervision, and actual intervention only in the case of error). Unattended bots are the best fit for back-office processes. But how do they become active, if they work unattended? The most common way to trigger unattended robots is via pre-set process schedule, or by a trigger such as an application program interfaces (API) event. Bots themselves can also launch other bots, via user interfaces (UIs). Before the actual implementation, you must wisely select the process(es) that make the best start of your automation journey. (Here are some questions to ask yourself to this end). Some features recommend the most appropriate processes to be automated. Being rule-based, highly structured, stable,and highly regular (with low exception rates) are some of these process features that you should aim for. More, it is advisable that RPA be first implemented for quantifiable processes, because this allows you to accurately evaluate the gains of automation.